It captures the world through the childlike wonder that, if you’re lucky, you will possess while travelling. The wonder of travel is fleeting. So is glee, joy, appreciation, and everything else good under the sun. As a nomad, real life continues while in amazing places. It’s easy to be caught up in worry and stress of everyday life while schlepping about in exotic locales. On lucky, rare days, I’m smitten with the world around me. Everywhere I look is something new and gloriously inspiring. But, yes, that’s rare. Most days, I struggle to make life fit my work needs and vice versa. Or I’m crestfallen after sleeping with a bad bed, or flummoxed by planning a later travel chapter. So unglamorous. Maybe I need to travel like a six-year-old more often. 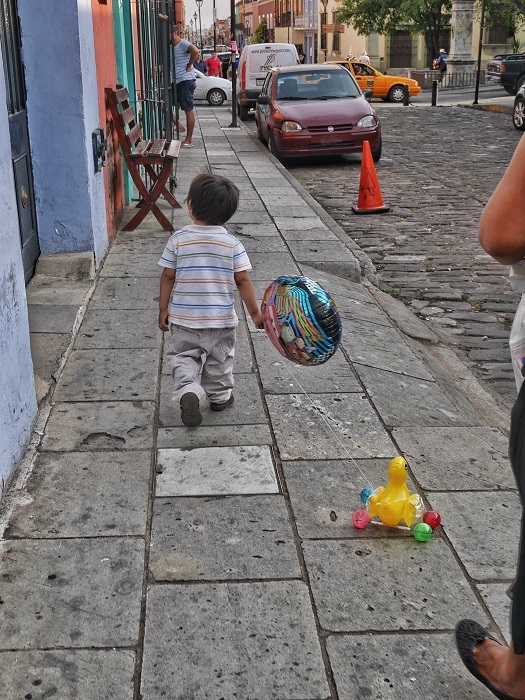 Sometimes I ponder whether the wonder of travel is better when you’re pulling a yellow duckie with a balloon. Oaxaca, Mexico. Alas, this week, I’m wrestling a dilemma. Do I accept the offer of housesitting for when I planned to leave the country, or do I stick to the reservation I’ve already made for my initial week in Bali? Decisions, decisions. One saves me $900, but the other gets me back into real travel sooner… and away from Western-style food, away from questionable beds, away from a social-heavy lifestyle preventing me from being focused on health the way I want to be. See, I believe in signs. Is the housesitting call coming after I book my lodgings a “sign” I’m supposed to change plans and stay for a while longer? Or did it come late because I’m not supposed to do it? Maybe it’s a test to see if I really want what I want. Because sometimes I believe we get tested, to see if we have the commitment our decisions require. Maybe that’s what it’s about. 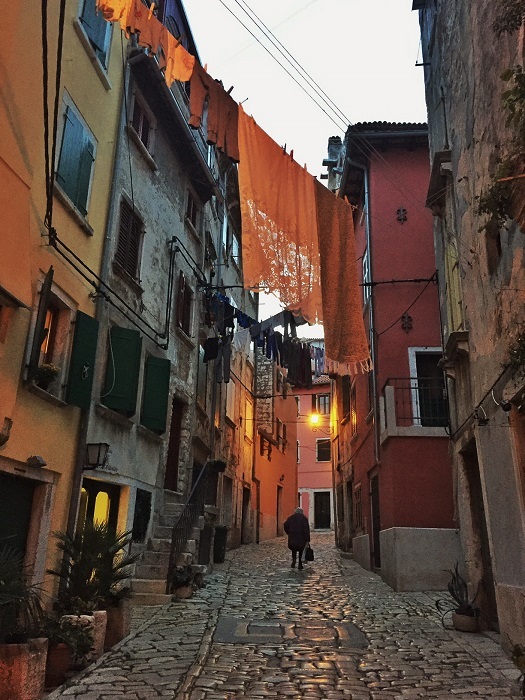 For me, Rovinj was heaven. For locals, it was an expensive life filled with tourists they didn’t enjoy. The wonder of travel often clashes with local realism. 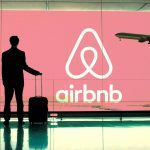 If I go by my 2016 example of travelling where money dictated choices, then housesitting to save more money is a bad move. My financial cautiousness and apprehensions last year did me no favours. It was a dark and unsatisfying time. And this housesitting is a place I’ve seen before, daily for years, a life I’ve lived before, a life I left behind. Where’s the wonder of travel there? There ain’t none. And sometimes I believe we create self-fulfilling prophecies. Like, being cautious with money because having little money requires cautiousness. Circular, no? A chicken-and-the-egg scenario. Does the apprehensive, guarded behaviour beckon a situation that requires maintaining apprehensive, guarded behavior, or vice versa? They say if you want money, spend it like you already have it. But that sounds like a ploy by Mastercard and Visa, who have a 19.25% stake in ill-advised spending habits. Maybe there’s an actualization twist at work, if that precept is true. Believe it, and it will come. Like “Field of Dreams” goes Zen. Maybe operating from the strictly frugal side of things makes one too cautious to see dividends pay out. Then again, when I opted into paying 15-20% more for rent in July, 2013, it was the most lucrative decision I ever made. That home became more productive and conducive to earning money than anything I’d experienced before. I spent it like I had it, didn’t I? Then I earned it. 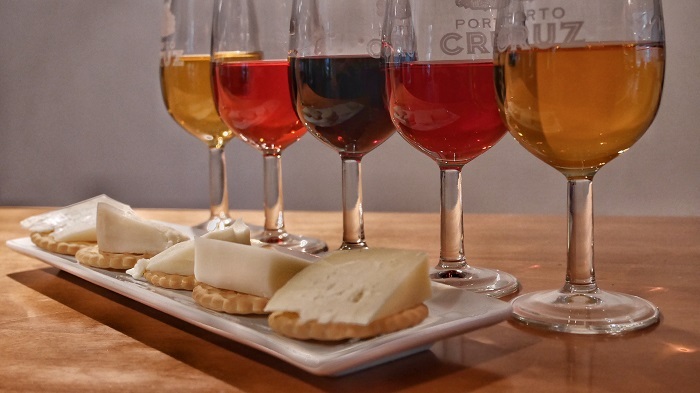 Five-flight taster of port in Porto, Portugal, and cheese. Sometimes travel is just that simple. 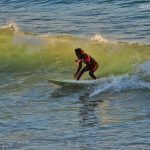 So, do I ditch house-sitting and stick with Mission: Bali Health? If I’m honest, I’ve spent two years avoiding Asia because I didn’t want to go. Now that I’ve made plans for it, I have yet another chance to avoid it. But now I’m twitching to start that part of my adventure, despite “low expectations,” so avoiding it is bumming me out. But you know what? I had very high expectations for Europe and a lot of those never really hit the mark. It turns out that I’ve discovered something you have to leave home to learn: Nowhere is perfect. Moments in time are perfect. Days are perfect. Activities are perfect. Places are not. Stay anywhere long enough and you’ll hear about the tax crunch, debauchery that lurks down streets, angry class divides no map ever reveals. You’ll hear complaints that “it’s not what it used to be” and life is getting worse. But everyone everywhere has quietly accepted that’s the way it is. Despite delusions otherwise, there’ll never be a Trump riding in on a white horse, making it all great again. There is no “great again.” We’re in a different world. So, will Asia be a dream come true? Certainly not. Will it be perfect? Far from. But can I like it more than I expect to? I probably will, because I’ve changed. I see beauty in strange places, I see joy despite pain. Different appeals to me now just because it’s different. The wonder of travel’s easier to dial into when you have realistic expectations. Children should be seen. Heard, too. 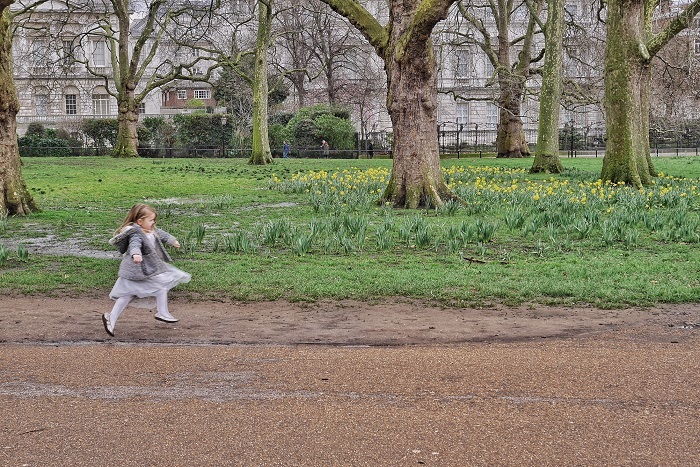 Because they remind us that sometimes joy is as simple as skipping through a park. London, England. Frankly, I’ll never see the world with childlike wonder. Instead, I see it through a pragmatic and considered older eye but that doesn’t mean the wonder of travel eludes me. The delusions of perfection have left me. Idealism and dreams of a glorious, beautiful world long since fallen away. We are flawed to our cores and I know it. The world is too. Climate change, corruption, commercialism – these affect every corner of the planet, and thinking otherwise is naïve and foolish. Yet excitement finds me every time I show my passport at an airport check-in counter. My heart races when I step off planes knowing that, for a shining, brief moment, a place is new and undiscovered for me. Yes, the world is damaged and flawed, but any fan of Rumi knows it’s in ruins and darkness when we find unexpected beauty and joy. However adult I may be, however dry and boring my life’s challenges are, travel often feels like Christmas – full of promise and gifts. For a while. It can’t be sustained day after day, week after week, but isn’t now and then enough? Isn’t the contrast between beauty and the banal far more thrilling than just gloriousness as an everyday rote experience?